Use Winsor & Newton Artists' Acrylic Gesso to prime surfaces and provide "tooth" for good adhesion of acrylics, oils, and alkyds. 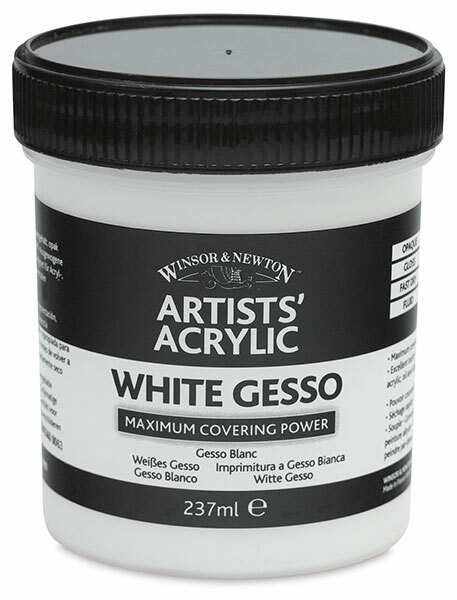 White Gesso — Winsor & Newton Artists' Acrylic White Gesso provides maximum covering power in one coat and offers maximum color reflection. It is fast-drying and non-yellowing, and it offers a balanced absorbency. Clear Gesso — This gesso offers a balanced absorbency and dries completely clear. Mix Clear Gesso with color for colored grounds in a ratio of 1:4. This gesso is also suitable for preparing surfaces to accept pastel and charcoal. Shipping Note — Due to manufacturer distribution restrictions, Winsor & Newton products cannot be shipped to addresses outside of North America. The Winsor & Newton Artists' Acrylic Mediums are a great compliment to the acrylic color range as they contain the same cutting edge clear resin to prevents color shift. See the range of these quality acrylic mediums and varnishes to enhance your painting experience — and results!